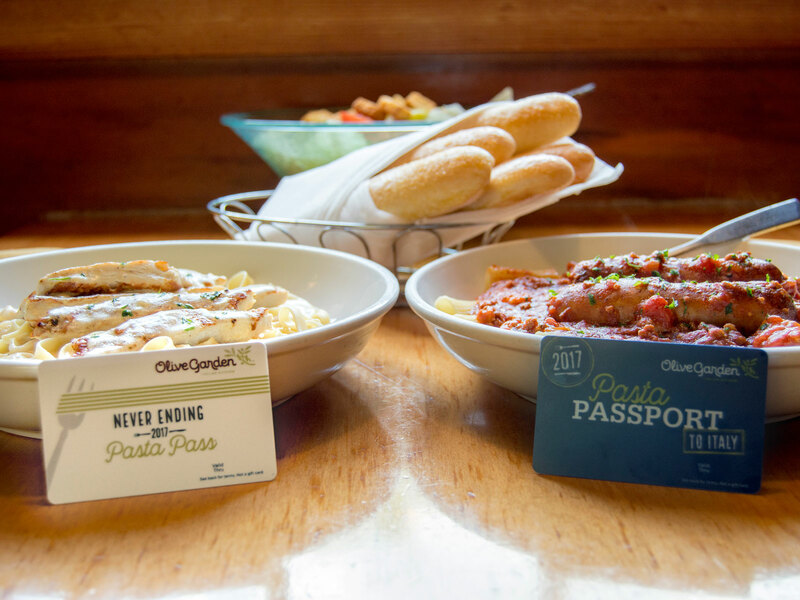 The luxury of Olive Garden’s Never Ending Pasta Pass is that you get to believe—if only in spurts, if always fleeting—that peace is renewable and limitless. Today is the day. I pick at my cuticles and lean on the escalator rail dragging me up towards the carpeted lobby, as the downstairs hostess says, “You have a single coming up,” into her Walkie Talkie. This single is wearing sneakers, jeans discolored by today's yogurt spill and a Meghan Trainor concert tee she found on a table somewhere because the rules are different in Times Square and the rules are even more different in the Times Square Olive Garden. The air, cool in a way that nature never could be, is vaporized garlic. Today is the day the upstairs hostess will say, “Welcome back!” or “Good to see you again,” and I will have to die, or, at the very least, pack my things and start anew in the Pacific Northwest. It’s the seventh day of this self-assigned quest, and I emphasize “self-assigned” because I must make it horrifyingly clear, for character development reasons, that no one asked me to do this, no one wanted me to do this: to eat at the Times Square Olive Garden alone for ten days in a row. 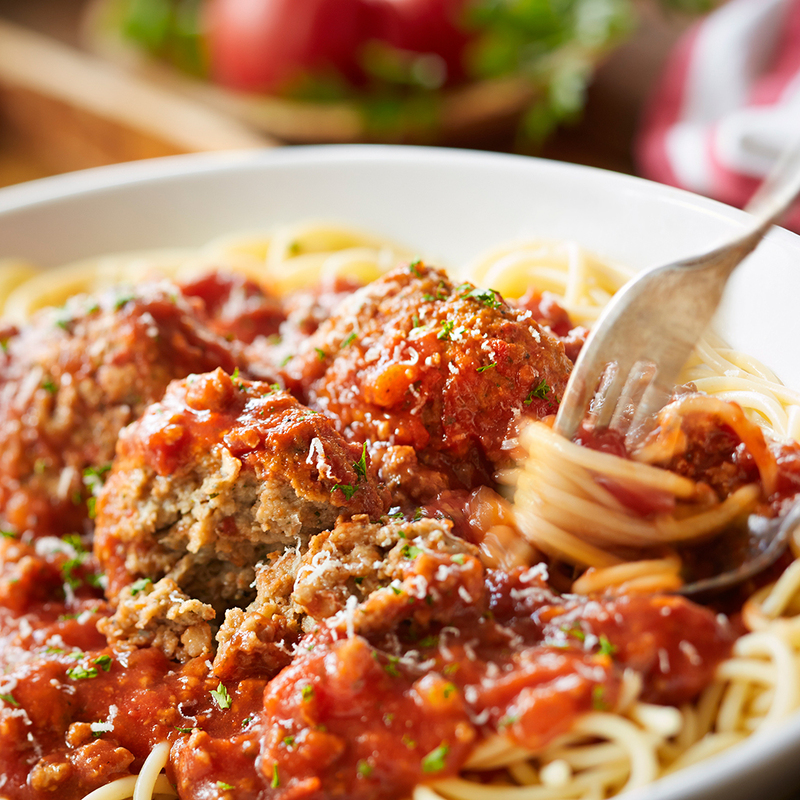 Using my Never Ending Pasta Pass, a $100 plastic card that, this year, sold out in less than one second, I’m free to sample an unlimited amount of pasta during the eight-week promotion: I choose my shape, sauce and protein and can refill the bowl as many times as my physiology will allow. I’m entitled to unlimited breadsticks and salad or soup, too, and that irresistible chain-restaurant ice water, all with pulsing neon views of New York’s most shat-upon quartier. Could I eat here, alone, every night for ten days? Could I trust myself to dine reasonably, or would I, like a golden retriever playing fetch until he dies of exhaustion, eat spaghetti until I am gone? Some people, I’ve heard, do yoga. The upstairs hostess’ face flashes with recognition, but she doesn’t say, “Hey, it’s you again, ya pasta lover!”—my worst fear. She simply smiles and leads me to my favorite seat, at a two-person table by the windowed wall that looks out onto Broadway and 47th Street. She treats me like I’m here for the first time, performing the standard welcome spiel, and for that I could kiss her. I wonder if the waitstaff has been instructed not to acknowledge my regularity, for fear of embarrassing me or forcing me to confront whatever happened to me as a child that made me like this. Tonight, night seven, I dine on rigatoni with meat sauce and meatballs. I watch an illuminated Karlie Kloss shimmy across the top half of a sky scraper, wondering how sharp I might look in a masculine blazer were carbohydrates not so enchanting to me. I grab a breadstick, a fluffy garlic-glazed hot dog bun, and wedge it into my mouth as a distraction. I will not let Karlie Kloss make me feel less than. Not here. Not again. My stomach groans and mutters and I am reminded you are never less alone than when you are alone. Delivering noodles to my face slowly, I read the menu to stay stimulated, wondering who has the job of creating words that sound Italian but are not. My wine glass reads “saluté,” cheers in Italian, but with an erroneous accent over the “e”—they must not trust Americans to pronounce the “ay” sound without one. No one here wants to make you feel stupid, and I think that’s beautiful. In her standup special “One of the Greats,” Chelsea Peretti posits that every person comes from either a poop family or a vomit family, based on what they mean when they say, “I’m sick.” A binary that makes more sense to me—if we’re committed to there being only two kinds of families, which, fine—is that between Olive Garden Families and Whatever Other Italian Chain Restaurant Was Near You Families. I’m a member of the latter. I grew up near a highway Bertucci’s, an Italian-American franchise known for its baskets of hot bread rolls and plates of garlicky oil, set and reset on your table throughout the meal so you never feel alone. I harbor a fondness for all chain restaurants, though, a love that exists liberated from such hip notions as “flavor complexity” and “inevitability of gas.” This makes me an American, I guess. Chain restaurants earn the “chain” part because people like them. Comfort is that which is repeatable, reliable and refillable; the iced water must always be refillable, without ever having to ask. You must believe you can drink it forever, in a universe where nothing ends or can happen to you. 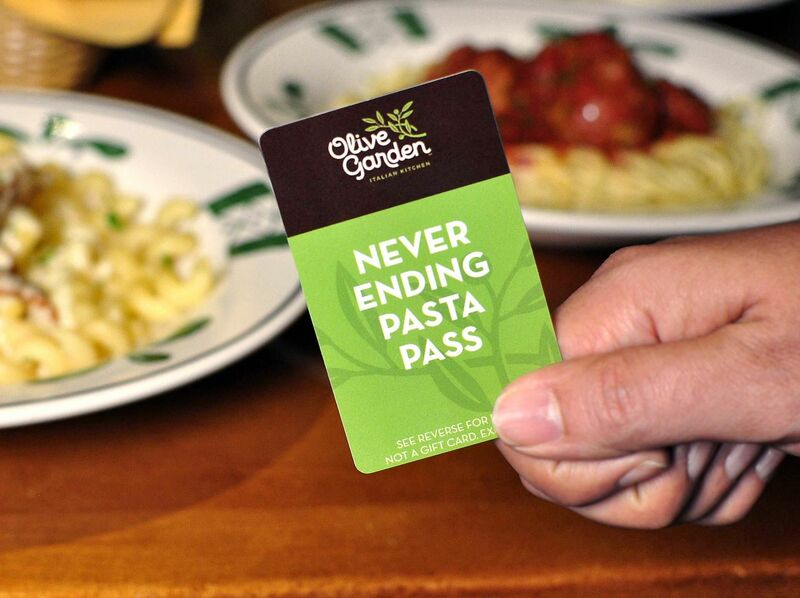 The luxury of Olive Garden’s Never Ending Pasta Pass is that you get to believe—if only in spurts, if always fleeting—that peace is renewable and limitless. I’ve never loved the food at OG, and not because I’m a purist. (For example: I am 100% committed to making a pumpkin spice corn dog I saw in a recipe video last week.) Having lived in Italy and being half Italian, I cherish Italian cooking, but I also appreciate well-executed Americanized interpretations of Italian cooking; it’s simply a different thing that can be delicious in its own right, if confusing to an actual Italian person. However, I’ve always found Olive Garden dishes over-sauced and over-cheesed, the breadsticks too cushy, the salad too crispy. Maybe things had changed. Within moments of sitting, I catch myself sneaking into other people’s conversations. I overhear a woman say, “And we’ll do the group salad. Even though we’re not much of a group.” This gets a big laugh from her husband and the waitress. Everybody gets the family-style salad bowl, even singles like me. Composed of roughly-chopped iceburg lettuce, olives, croutons, onion and tomatoes, the mix is always undertossed, the dressing glopped unevenly to invite guests to toss it themselves, as they would in their own homes. Every detail here from the wicker trash baskets in the bathroom to the make of the salad tongs is meant to say, “It’s nice here,” but in a special-occasion-at-your-grandmother’s-house way, not in a you-mustn’t-wear-Meghan-Trainor-concert-tees-here way. Tonight I eat the first (and worst) pasta combination I’ll have in the entire ten days: linguine with creamy mushroom sauce and little fried shrimps. The combination is too much. My body aches, and I can only manage half, though I ride that rush I always get from salty, butter-lubricated noodles. I’m as far from hunger as I’ll ever be. I unbutton my jeans and pop three gas pills. In the first moments of eating alone at a restaurant, you’re hyper aware of your motions and how everyone—who, to be clear, don’t care—might perceive you. When you consider that some might find your aloneness pitiable, you sit up straighter, ordering a half-liter of the Tuscan Red Blend loudly and decisively. You’re out of data and feel too disenfranchised to ask for a wifi password, lest you draw more attention to yourself, so you browse the tweets already loaded on your phone, then write a draft that’s just the words “beep boop, beep boop, beep boop.” Sighing, yawning, looking at the menu with the sort of laser attentiveness you don’t even grant friends or exploitative murder documentaries—this is how you show yourself and others that you are fine, completely fine. The next part is strange: You lift a glass of ice water to your face and blow down on it, as if to cool it. As is true of ice water, it isn’t hot, but here we are with the performances, the staying occupied. Because now you must prove something to yourself, as you tuck your phone deep into your tote bag under the thick layer of receipts and cookie crumbs: You can eat a meal by yourself; you can be alone. On day three I realize that other pass-holders are actually making good on their refill privileges, something I’ve felt too queasy to do; a man at the table beside me orders a second round of rigatoni, five-cheese sauce and meatballs. “Another round?” the waiter asks, so beautifully free of judgment that my arms prickle with goose bumps. Next he does linguine, mushroom sauce and fried shrimps. Pasta pass-holders order rounds of pasta like one would pints of beer at a bar, and there’s zero bashfulness. Judging is bad everywhere, but here it’s impossible. We are all here at the Times Square Olive Garden, so we are all equals. Dining in one of the best food cities in the world, we chose an establishment that is replicated hundreds of times around the country, and we are happy. 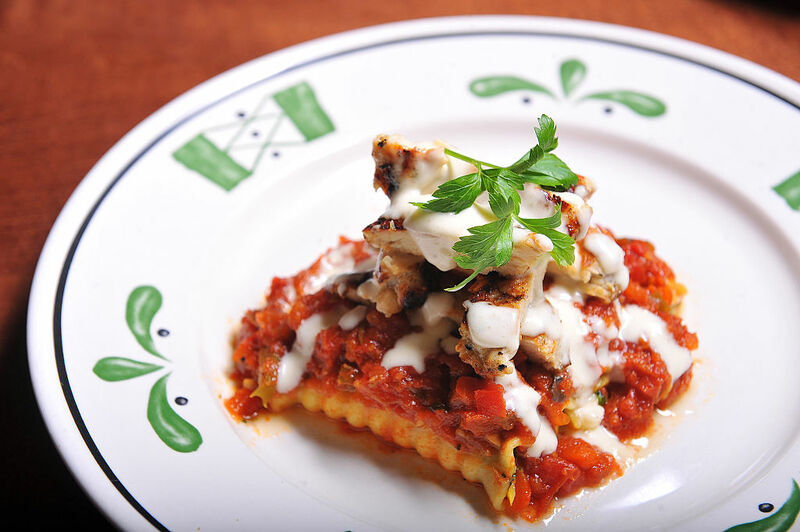 Over the next few days, Olive Garden becomes my life. When friends talk to me, they look like giant breadsticks. It’s the only thing I think about. I dread the food but crave the feeling, and when I'm there I enjoy the food, no matter what it tastes like. One night, I marvel at how miraculous it is that the Times Square Olive Garden feels cozy, even with these views of buildings hyping Morgan Stanley and the city of Cancun. I make eye contact with Cara Delevingne as I bite into a crouton. The house red goes down like the inside of a Gusher, and my linguine with marinara, while watery and under-seasoned, tastes like a hug. I am safe and in love. There’s a distinct type of sadness that comes from realizing you dressed up to eat alone at the Times Square Olive Garden, and another one from realizing that by “dressed up” you mean “shower.” By day eight, I try to reintroduce the novelty of eating here, which I dread all day until I arrive and a server says he’ll be taking care of me, can he start me off with anything to drink. Powerless to these charms born from a business school grad’s imagination, I feel that sweet, predictable rush when salad and breadsticks are swiftly set on my table, and I, once again, inhabit abundance. I exhale. My body has stopped fighting the food. I’m no longer gassy, or at least not gassier than normal, which is pretty gassy. My biochemistry has adjusted, and Olive Garden is part of me now. I’m finishing my plates. I’m eating two breadsticks a meal. I feel agitated all day until I ride up that escalator and disappear from New York, from routine, from the fitness goals I set and abandon over the course of a single cookie. On my tenth night, they tell me they have “no tables for singles.” My only choice is to sit on a stool and order the linguine with marinara and grilled chicken from the bar. Beside me a bearded man scrolls through what I swear is MySpace, looking up only to order more soup. I haven’t wanted soup this whole time; I chose the salad every night. I’ve grown to adore that gloppy Italian dressing, the way the croutons soak it up until they’re soft. When I make salads at home I am careful with the dressing and the oil, a concern I picked up in my teenage years, along with an aversion towards white carbs and bread for bread’s sake. I wonder if that’s what this has all been about. Proving to myself I can practice restraint in the face of infinity? Proving to myself I’m cured of adolescent disorders, and can hang? I trust myself now, but I can’t unlearn everything. I can't unlearn that breadsticks are 140 calories, that I don’t need grated cheese on my pasta, that ordering sauce on the side saves you an hour-long workout. A waiter leads a family to a table flanked by windows on two sides, offering the grandest views of Times Square in the building. “Hey baby girls, look where we’re at.” The woman’s daughters are too young to know they’re supposed to take stocks of moments, but they seem thrilled nonetheless; one bangs on the window and the other taps through a Snapchat story. Committed to abandoning my phone tonight, I read the salt label over and over. I clap when the waiters swarm a birthday boy, singing. I clean my plate.